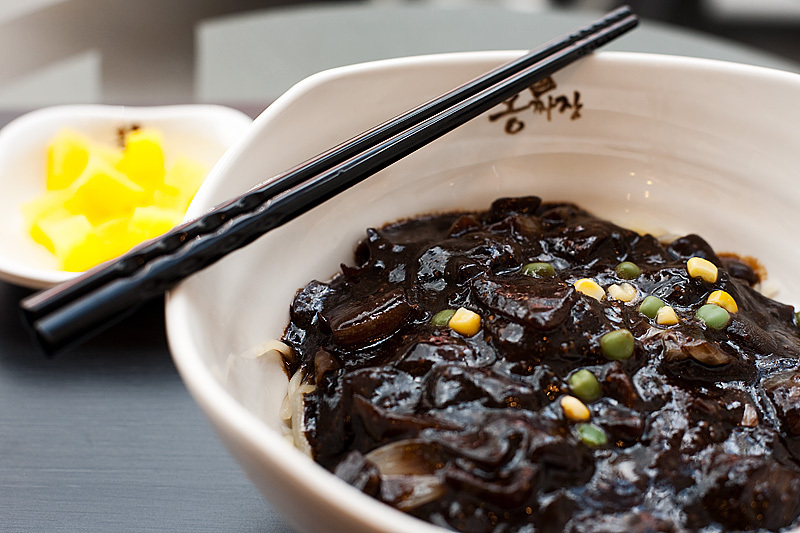 Jjiajiang myun (짜장면) is a Korean noodle dish featuring a sweet black bean sauce, originally brought over from China but tweaked for the Korean palette. The sour yellow side dish, called dan mu ji (단무지), is made from pickled radish perfectly complements the taste of jjiajiang myun. Anyone else drooling besides me? On a personal note, years of my mother's torture teaching me how to read and write the Korean alphabet (hangul - 한글) finally pays off. However, I do remain functionally illiterate. When I read, I can make out the sounds but rarely understand the meaning of the words... whoa is me. This photo is part of my ongoing real-time posts of pictures taken recently in this country, started September 1 (yesterday). It's originally Korean food not from China. And not 짜장면! 자장면 is correct. Technically, Kim is correct. This is the spelling advocated by the Society of Korean Linguistics. However, the variant spelling is commonly seen and spoken in day to day use. The origin of this dish is, indisputably, Chinese, though one is hard pressed to find it eaten in China these days.